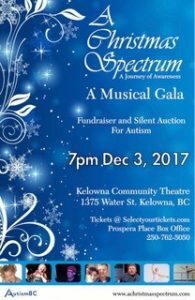 Here in the beautiful Okanagan Valley we are launching our first Christmas Musical Revue for Autism called “A CHRISTMAS SPECTRUM”. This project was born out of a commitment to increase Autism Awareness and will be produced by Lana Caputi, a talented and inspiring writer, director, choreographer, and actor, who, through this medium, will honour her and other’s experiences with autism. This project is the first of many fundraisers with the goal of raising $1 Million for Autism. The target area is between the ages of 18 and 28, where families of Autistic children come to the place of “NOW WHAT?” – Some call it the “CLIFF”. As THE CHRISTMAS SPECTRUM generates funds from the Kelowna community and beyond we hope to see more programs developed that will sit under the umbrella name ‘The Cliff’, funding multiple projects aimed at supporting families and individuals affected by Autism. FOR AUTISM… ABOUT AUTISM… WITH AUTISM… COME BE INSPIRED!